YOU can help raise money for Pilot Dogs. It is very easy. Just attend the tournament and present our charity ticket at the gate. Pilot Dogs earns $10 for each charity ticket turned in! The tournament is held at The Ohio State University Golf Club, Scarlet Course. It is the third of four Web.com Tour Finals events that help determine which players will earn their PGA TOUR card. As a reminder, grounds admissions for the tournament are FREE! Pilot Dogs will earn $10 for each person who attends the event and presents our complimentary charity ticket at the entrance gate. Gates are staffed from 7 am until 3 pm. One Ticket per person per day. There’s always something fun happening at the Nationwide Children’s Hospital Championship! Food trucks and/or concessions at Pub 13 daily! Birdie Time is Miller Time each time a pro gets a Birdie on 13 – beer specials for the next 13 minutes! Raffle, putting challenge and fun galore!!!! Download and print the attached Charity Ticket for Pilot Dogs. Email or print extra copies to give to your family, friends, and coworkers. It can be printed in black and white. 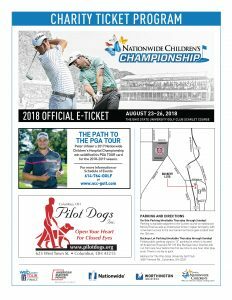 The only rule is that charities may not distribute tickets within one mile of The Ohio State University Golf Course or within any of the event parking areas. Any charity found distributing tickets in this way will be disqualified from the program for 2017.